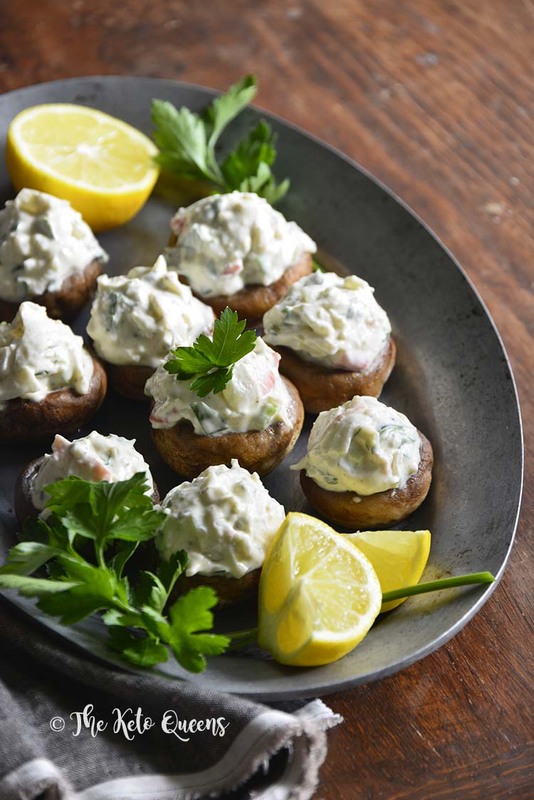 Chilled Old Bay Crab Salad Low Carb Stuffed Mushrooms is an easy appetizer idea that’s perfect for serving at your next summer gathering. In the summertime, it seems like there’s always some kind of party, potluck, or BBQ going on. 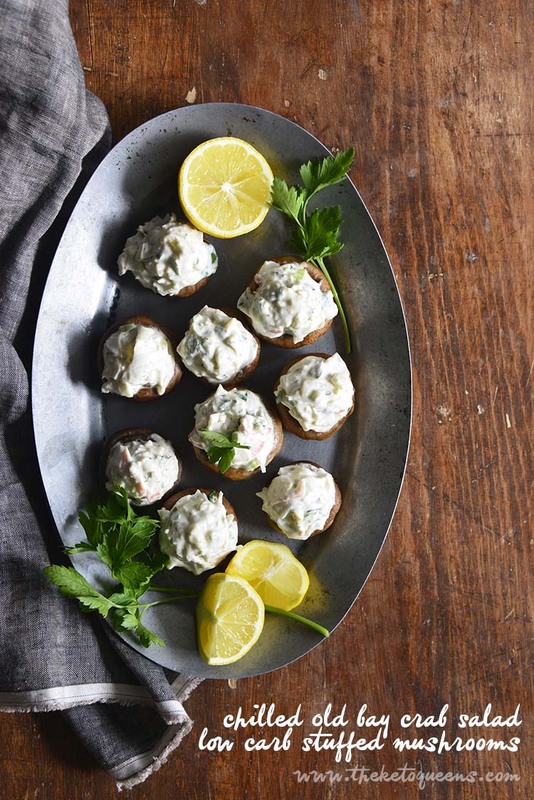 Because of this we’re always on the lookout for crowd-pleasing appetizer ideas. 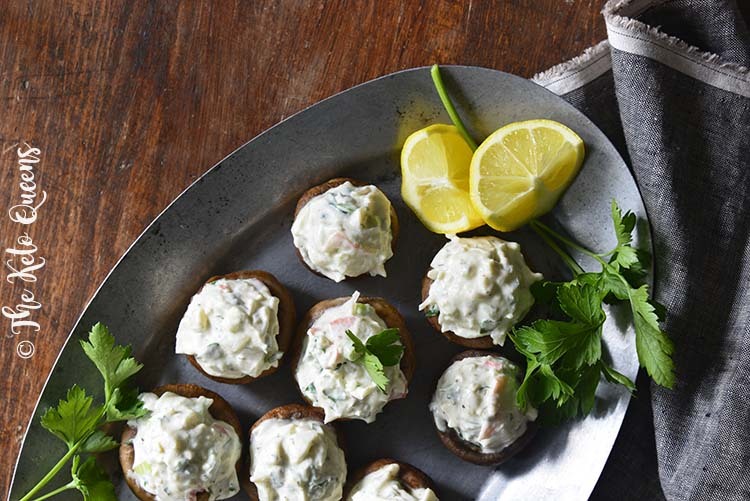 This recipe for Chilled Old Bay Crab Salad Low Carb Stuffed Mushrooms takes our classic zesty Keto Low Carb Creamy Crab Salad recipe and uses it as a stuffing for mushrooms. We keep them chilled so these low carb stuffed mushrooms are refreshing and great for summer gatherings. The result is elegant, flavorful little bites. Here at The Keto Queens, we love our low carb stuffed mushrooms! We make a few different varieties, some stuffed with cheese and others filled with meat, sometimes served hot and other recipes served cold. We don’t discriminate when it comes to low carb stuffed mushrooms! This Chilled Old Bay Crab Salad Low Carb Stuffed Mushrooms recipe is a delicious trick to have up your sleeve. Because they’re served chilled, these mushrooms are perfect for hot summer months. Also, stuffed mushrooms are easy to make and always a hit, making them wonderful party food for summer entertaining. In 1939, German immigrant Gustav Brunn developed Old Bay Seasoning in the Chesapeake Bay area (read more about the history of Old Bay on Wikipedia). Because it pairs so well with seafood, Old Bay is commonly used on the Eastern Seaboard of the United States as a seasoning for crab, shrimp, crab cakes, crab and oyster soup and stew recipes, seafood dips, etc. What is in Old Bay Seasoning? The ingredient list on the container reads as follow: celery salt (salt, celery seed), spices (including red pepper and black pepper), and paprika. It’s thought that Old Bay also contains the following spices: mustard, white pepper, bay leaves, cloves, ginger, nutmeg, mace, cardamom, and cinnamon. What is a Substitute for Old Bay Seasoning? If you can’t find Old Bay Seasoning, you could try your hand at a homemade version of the recipe. If you don’t mind a slightly different flavor profile, you can use seasoned salt, which is typically a blend of the following ingredients: salt, pepper, paprika, chili powder, onion powder, garlic powder, cayenne pepper, dried parsley flakes, and occasionally turmeric and celery seed. A word of caution though, store-bought seasoned salt can frequently also contain sugar, so be sure to check the ingredient label! What Does Old Bay Seasoning Taste Like? Old Bay Seasoning tastes like an amped up version of seasoned salt, but with a slightly spicy kick of heat. Celery seed and mustard also add distinctive flavor, while warm spices (like cinnamon and nutmeg) and cooling spices (like cardamom) create a balanced complexity. Preheat the oven to 375F. Line a large baking sheet with parchment paper or a silpat liner and spray it with avocado oil. Arrange the mushrooms on the baking sheet and lightly spray the tops with avocado oil. Bake for 15 minutes, flipping the mushrooms once halfway through cooking. Set aside to cool slightly, and then pat off any excess liquid. Meanwhile, for the filling, add the butter to a small skillet over medium heat. Once hot, add the onion and cook until softened, but not browned, about 3 minutes, stirring occasionally. Add the garlic and cook 1 minute more, stirring constantly. Add the onion mixture to a large bowl along with the cream cheese, sour cream, mayo, Parmesan, parsley, scallion, lemon juice, dill, Old Bay, and Worcestershire. Stir in the crab. Scoop the mixture into the mushrooms.